Phuket is blessed with an abundance of world class picturesque sandy beaches, bays and coves, and clear turquoise waters. Many of the beaches are situated on the west coast of the island. There is something to cater for all tastes and desires, and if for example you are searching for complete peace and quiet, then you can easily find it. The high season in Phuket stretches from mid November to late April. The low season (May to October) more or less coincides with the SW Monsoons, which bring wetter weather and occasional unpredictable sea conditions - be prudent and less adventureous at this time and observe any warning flags. The spectacular 3 kilometer sweeping sandy bay of Patong, situated on the west coast of the island, is of course the most well known and most developed of all Phuket's beaches. In addition to sunbathing and swimming, sections of the beach offer numerous activities - paragliding, jetskiing, windsurfing, snorkelling and sailing. Patong itself is a great place to really enjoy oneself and it is renowned for its leisure activities, excellent shopping, superb restuarants (featuring Thai and International cuisine and mouth-watering seafood), and its truly vibrant nightlife. It continues to be a very popular and fun resort. At the far southerly end of Patong Beach, drive up the ramp/bridge (across the Patong river, close to the Amari Hotel) and follow the road (Muean Ngen Rd) around for about three kilometers or so. En route you will pass the Baan Yindee hotel on the left hand side. Then further on you will pass the Tri Trang Beach Resort on the right hand side - this resort is actually at the east end of Tri Tra beach and it is a bit of a mystery in naming convention as to why Tri Trang Beach Resort is situated at Tri Tra beach, rather than Tri Trang beach. You will soon reach the Merlin Beach Resort on the left. This resort does not entirely block access to Tri Trang beach as there is a small dirt track to the beach immediately before the hotel. A couple of hundred yards past the Merlin is the western end of Tri Tra beach, on the right hand side. At this point, there is a sharp incline with a single track paved road leading to Paradise beach - this road is actually gated further on (only open in daylight hours). 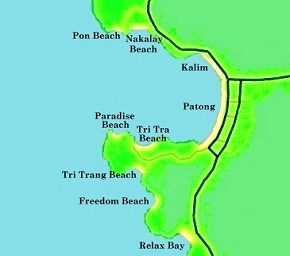 Paradise beach is on the southern headland of Patong Bay. This is a very beautiful and quite small sandy bay with a few boulders scattered about, and a jungle backdrop. There is a coral reef close to shore. Thus snorkelling is good but swimming is fair (only at high tide). All in all, a lovely setting. This is an isolated beautiful white sandy bay, which can only be reached by boat - a ten minute ride by longtail boat from the southern end of Patong Bay, or less from nearby Tri Trang beach. It is supposedly a private beach which is open to the public, and, as is the case with Paradise beach, it is quite a contrast to the bustle of Patong beach. The northern and southern ends are cordoned off for swimming, and the southern end has excellent snorkeling. Tri Tra beach is located in Coral Bay. It is a picturesque shady beach lined with casuarina trees. This is a beach for simply relaxing away from any crowds. The bay has several small corals scattered about, so swimming is not fantastic. Swimming is better at the eastern end. This is a nice quiet bay located behind the Merlin Beach Resort - access is via a dirt track at the side of the hotel. There are however several rocks on the sandy bottom. Thus it is better for swimming at high tide. It is quite a good beach for snorkeling. There are (infrequent) longtail boats from this bay to Freedom Beach. Relax bay is a lovely small sandy bay just a few minutes drive, south of Patong Beach. However access by road is actually blocked by Le Meridian hotel. Unless you are a hotel guest, you need to take a longtail boat from Patong to reach this beach. This is one of Phuket's largest beach. It is quieter than Patong but still has a comprehensive range of accomodation, facilities, activities and restaurants, mainly at its northern point. Karon has an extremely long wide white sandy beach (which eventually leads into a fine coral reef close to Kata), and there is relatively little in the way of commercial development along the way. Kata has a quite scenic village atmosphere at its northern and southern ends, as the central beach area is flanked by two small headlands. The waters are very clear and calm, and there are fine sands. It is ideal for families and couples to relax, swim and snorkel. The narrow beach road is well shaded, and Club Med. are ideally situated nearby. Just offshore lies the lovely Bu island. Noi means small in Thai. Accordingly this lovely small bay, about 1km south of Kata itself, is named Kata Noi, in typical Thai style. This is a superb quiet beach with little development and only a few shops and restaurants nearby. The Kata Thani resort complex is the main highlight for accomodation. Very small sandy stretch with difficult steep dirt road access (use 4WD or moto-cross bike or walk only). It lies between the Kata Viewpoint and Naiharn. Isolated and basic. Continueing south from Kata, over some hilly terrain and past the famous (sunset) View Point, lies the soft sands and clear waters of Naiharn beach, which is bordered in part by a gorgeous lagoon. This is a nice peaceful relaxing spot and typically not very crowded. There is very little development, in part due to the nearby Samnak Song Nai Harn monastery. It is also the location of Le Royal Meridien Phuket Yacht Club. This is a very small cove with rocky shoreline and coral outcrops, adjacent to Naiharn. Approach via the underground carpark of Le Meridian Yacht Club, and continue 1km thereafter along a rough track. It is usually quiet. Small slice of sand with steep headlands twixt Promthep and Rawai. This is a sleepy little hideaway, and is quiet isolated and very basic. There is good snorkeling and interesting rock formations. Bathing not recommended from April to November. Rawai is situated at the southern tip of Phuket. It is Phuket's longest-established beach resort, but not a good swimming or bathing spot. However it has great scenic views to nearby small islands and the beach is lined with open-air seafood stalls and restaurants under the shade of the casuarina trees. It is very popular with the locals for casual afternoon or evening dining, and is also a launching point for boat trips to Racha, Coral and other islands. The N.E. corner has a very small sea gypsy village and fresh fish market. Just past the fresh fish market is the lovely small sheltered 150 metre long beach of Laem Ka which is ideal for swimming. The cape lies south of Phuket Town, and, despite its proximity, it remains a peaceful and charming locale, with jungle hills, mangroves, tidal flats and a few sandy coves. However swimming is quite limited. At the southern tip lies the Marine Biological Research Centre and also Phuket Aquarium with a wide range of local exotic marine life on display for visitors. This bay and fishing village lies north of Patong, and has had only limited development. It is not very touristic and has a large muslim population. The village includes several food stalls and restaurants. It is not very popular as a swimming resort. Phuket Fantasea is a further couple of kilometers north. This very small curved bay is a beautiful spot at the foot of forested hills just south of Surin. Access is on foot only down a steep path. There are basic amenities but it certainly is picturesque. The beach is quite popular at times even though it is a little bit rocky. Pansea is a very small and georgeous cove of white sand, just north of Surin. It is one of the best beaches on the island. However it is essentially a private beach. Access is only via the deluxe resort of Chedi and the ultra exclusive Amanpuri Resort These two resorts cater for international celebrities. Bang Tao is a beautiful wide sandy bay and ranks as one of the longest beaches in Phuket. Adjacent to the bay is the luxury five resort complex of Laguna, set in lovely grounds with several small lagoons and golf course. The complex offers a range of tourist facilities and restaurants, as does the nearby village of Chern Thale. Naithon is an impressive smallish bay with white sand and is approached via scenic forested hills. It is an extremely peaceful, lovely and picturesque retreat where one can swim and sunbathe in almost isolation at times. It is well sheltered. Both ends of the beach are flanked by rocky headlands, which extend into the sea and have corals and attract a lot of marine life. Naithon Noi Beach is a very nice stretch of sand just before the main Naithon Beach, and is also known as Banana Rock beach and Hin Khruei. Nai Yang is a long curving bay lined with casuarina trees. There is quite a large coral reef with many species of fish. The northern end forms part of the Sirinath National Park, and as such is a protected marine and coastal area, and is a site where sea turtles (sadly in diminishing numbers) come to lay their eggs between November and March. At the southern end, there are a couple of good hotels. Mai Khao is an excessively long deserted sandy beach covering many kilometers on the north west of the island. It is Phuket's longest beach. It simply stretches and stretches and stretches. There is almost no development or tourist business except for one luxury hotel. The beach is a very lonely and isolated place, and you can walk for simply ages without seeing a soul. Swimming is good, but is definitely not recommended from May to October due to strong currents. As with Nai Yang beach, sea turtles frequent this beach to lay their eggs. Heading north from Rawai, now on the south east coast, one reaches Chalong bay after a few kilometers. This bustling bay is not suitable for swimming but is rather a major launch area for boat and dive trips. There are a few dive shops, fishing charter and tour operators, watersports equipment suppliers, and internet shops in the short street leading to the pier from the well known roundabout. An excellent beach front dining area, with superb views of Chalong bay and distant Panwa, lies less than 1 km north of the centre.